As an avid Disney fan since childhood, the concept of TOMORROWLAND was pretty exciting; another dimension beyond the world of Disney where only a select few are worthy of visiting. The beginning of this film keeps every Disney fan’s dreams alive. However, as the film progresses, the quality of this storyline deteriorates. George Clooney plays Frank Walker (initially played by Thomas Robinson) a former boy-genius inventor who teams up with an imaginative and determined teenager Casey Newton (Britt Robertson), to try and save Tomorrowland and consequently the Earth’s future which will supposedly end in the next 60 days. 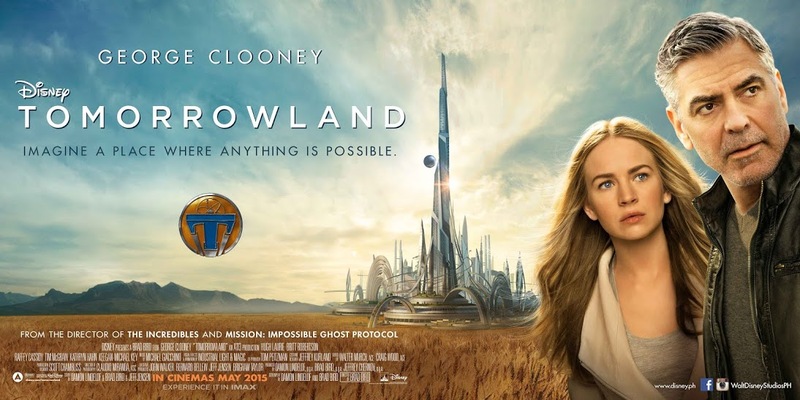 After watching a George Clooney interview on THE GRAHAM NORTON SHOW a couple of weeks ago, I was really excited by the fact that Tomorrowland was once a plan of Disney’s; to create a hidden world within a theme park. However, any excitement I once had was plucked away from me within the last 100 minutes of this film. The film starts strong, revealing a secret passage within a Disney theme park in the 1960s, a futuristic world which dreams are made of and jet packs, yes jet packs! Frank Walker, although annoying at times as a boy, is relatable and the viewer is initially drawn into his story. However, from here onwards, the film loses its way. Britt Robertson brings comedy at points when she first discovers Tomorrowland and keeps walking into walls and falling down stairs, however this is as good as it gets with her. George Clooney plays a sarcastic and bitter old man, who has all the gadgets you could imagine in his house, which perhaps creates the best scene in this film! He starts off as a very cool character and interesting to watch, but as the film moves on he, as well as the rest of the cast lose the attention of the viewer and suddenly a very smart and creative live-action film from Disney becomes cliché and tedious to watch. I have never really been a fan of Hugh Laurie, rising to stardom through cheesy roles and simply being sarcastic, but his character perhaps brings the one great dose of reality and honesty into the feature, suggesting that the human race has accepted defeat and the collapse of our world is a result of years and years of not caring enough to act on the problems facing us. Overall, TOMORROWLAND is not really one for the kids, due to the attempt to overcomplicate the storyline. It is also not really one for the adults as it lacks a credible script and appears all too cheesy and cliché to enjoy. Personally, from two live-action films this year which have once again showcased Disney’s talents in teasing and promoting new films (not over-explaining or spoiling films like a lot of companies do these days), the end products have both been disappointing to say the least. Of course I have not seen CINDERELLA yet, but TOMORROWLAND and INTO THE WOODS are two definite cases of straight to Netflix, and could be perhaps showing why Disney should leave the new and creative ideas to animation and leave live-action creations for remakes of classic films. Recommendation: Not worth the cinema ticket! Hold out for a Sky Movies/Netflix/Amazon Prime etc. premiere.